Be the first to share your favorite memory, photo or story of Lora. This memorial page is dedicated for family, friends and future generations to celebrate the life of their loved one. Lora Juanita Clayton, daughter of the late Clarence and Emily (Jones) Ingram, was born February 22, 1933, in Ozark County, Missouri, and went to her heavenly home January 30, 2019, at the age of 85. She married Hillis Clayton in 1950, and to that union they shared three children: daughters Connie and Cathy, and son Ronnie. They lived in Waterloo, Iowa, where Hillis worked for John Deere. After retiring, they returned to Missouri and lived in Mountain Grove the rest of their days. Lora spent most of her time as a homemaker, but briefly worked as a housekeeper and also as an egg packer at Long’s Chicken Farm. She enjoyed quilting while her health permitted. The most important thing to her was being saved, and being sure that all of her family was saved. Besides her parents, she was preceded in death by her husband, Hillis, her son, Ronnie, and one sister, Velma Mahan. 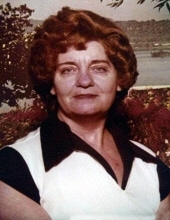 Lora is survived by two daughters, Connie Stevenson and her husband, Dale, of Mountain View, Missouri, and Cathy Goodman and her husband, Jeff, of Mountain Grove, Missouri, four grandchildren, Michael Burch, Brian Burch, Amanda (Burch) Apple, and Nikki (Goodman) Caswell, several great-grandchildren, one great-great-grandson, and two sisters, Lois Clayton and Judy Culp and her husband, Billie. To send flowers or a remembrance gift to the family of Lora Juanita Clayton, please visit our Tribute Store. Contributions may be made in the care of the funeral home. "Email Address" would like to share the life celebration of Lora Juanita Clayton. Click on the "link" to go to share a favorite memory or leave a condolence message for the family.